Laura specializes in pelvic floor muscle dysfunction. 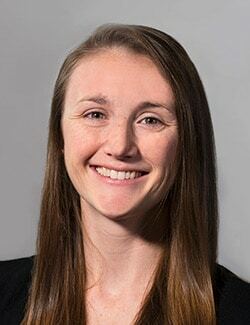 She utilizes conservative, hands-on physical therapy techniques, as well as biofeedback methods, to help her patients achieve their goals and gain back independence from debilitating bladder, bowel, and pain symptoms. Laura has a particular interest in the pre- and post-natal population. She is actively working toward a Certificate of Achievement in Pregnancy and Postpartum-Obstetrics awarded by the American Physical Therapy Associated Section on Women’s Health. Certificate achievement is anticipated early 2019. Laura has prior experience working in the hospital, inpatient/outpatient rehabilitation settings, and personal training. Laura lives in Norfolk with her husband, daughter, and two dogs. When not working, she enjoys playing Ultimate Frisbee, hiking, riding her bike, and going to the beach.